U.S.-backed Syrian Democratic Forces announced Tuesday that they had captured the city of Raqqa from Islamic State militants. “Everything is finished in Raqqa, our forces have taken full control of Raqqa,” SDF spokesman Talal Sello told AFP. A formal declaration would be announced after operations to clear any remaining sleeper cells and to remove landmines in the city were completed, Sello added. The move is a major setback for the Islamic State which considered Raqqa the de-facto capital of its self-declared caliphate. It comes on the third anniversary of the global effort to defeat ISIS. Raqqa was the first provincial capital to fall from government control in March 2013 after it was captured by a rebel army. The army included both Syrian opposition groups and more hard line parties including al-Nusra and the Islamic State. A civilian government that was established in the city divided two months later, and less than a year later ISIS recaptured Raqqa and named the the capital of their caliphate. About 900 civilians have been killed since the the start of the five-month operation, including 570 people in coalition air raids, according to the Syrian Network for Human Rights. The Britain-based Syrian Observatory for Human Rights put the civilian death toll at 1,130 people. American journalist James Foley was beheaded in the mountains south of the city. 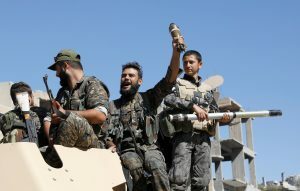 SDF fighters pulled down the Islamic State’s black flag from the city’s National Hospital near the city’s stadium, according to a Reuters report. It is not clear when the 300,000 civilians who have fled Raqqa since April during the operation will be able to return.